More than 500,000 workers have left the financial sector since the recession began. Many of them became franchisees. When Eric Diaz pulls up in his Aussie Pet Mobile grooming van, it's hard to envision him in a suit and tie. He's relaxed while combing out an Afghan or trimming up a Shih Tzu, wearing a company pullover and a prominent gold Yankees necklace, something that never made it out of his undershirt at his old job. A little over two years ago, Diaz was a different type of pinstripes man, traveling the world building customer service applications for Wall Street behemoth Merrill Lynch. But just months before America began Googling credit default swaps and underwater mortgages, Diaz sensed something in the water, and took a buyout. He traveled for a year, and when he returned home, he decided to do something many "sophisticated investors" on Wall Street might thumb their noses at--he bought a pet grooming franchise in Hudson County, N.J.
"My job at Merrill Lynch was very, very rewarding financially and personally," he says. "I did it for 20 years. But so far, I love dealing with doggies equally." Diaz isn't alone in shifting gears so dramatically. Since the Great Recession began in December 2007, an estimated 550,000 workers have left or been booted from the financial sector in the United States, with 200,000 of those in New York City alone. That's a decrease of roughly 6.5 percent. While many of those displaced number-crunchers have continued knocking on doors trying to get back into the world of six-figure salaries and massive bonuses, a good proportion--especially those with a nice nest egg in the (hopefully solvent) bank--decided the financial meltdown was a natural break for their careers and made the leap into small-business ownership, with many turning to franchising. But most former bankers and Wall Street personnel are not your garden-variety franchisees. Though many are first-time business owners, they bring a unique skill set to the franchise world and in most cases have no problem easing into self-employment. Many have savings to invest and can circumvent the tight credit market; most have been steeped in numbers for decades and have a firm grasp of accounting and finance; some have built successful business plans for other companies; most have worked in an environment that demands a level of customer service any franchise system would envy. "Generally, Wall Street people are self-motivated, risk takers, multitaskers and familiar with the way money flows into and out of a business," says Brian Miller, president of The Entrepreneur's Source business coaching franchise and a former Wall Street employee himself. "They bring a lot of passion to what they do. They will not accept Plan B and have a burn-the-ships mentality. That professional persistence bodes well for them." Roy Cohen, a career coach and author of The Wall Street Professional's Survival Guide, notes that the financiers-turned-franchisees tend to be Wall Streeters in operational roles, "in the mid or back office versus traders or investment bankers." And that instability is often a motivator. "There's a lot of anger when people are separated from their companies involuntarily," Cohen says. "After that, there's often a desire to have some power to direct one's career." That self-determination was the appeal for Robyn Vescovi, though she wasn't forced out. In fact, when she left a little more than a year ago, she was being headhunted by multiple financial firms (she'd been an executive learning officer for Goldman Sachs, U.S. Trust, Bank of America, SAC Capital Management and others). But she was burning out. "The last three years of my career I was really tired, to say the least," Vescovi says. "I had to ask myself, ‘Is this what I want to do for the second half of my life?'" In October 2009, she moved to Boynton Beach, Fla., to become area developer for the Tasti D-Lite frozen yogurt chain. Froyo is about as far away from Wall Street as you can get, but Vescovi says her experience gave her a jump on setting up her initial franchise and selling the concept to others. "A lot of what I learned in the financial sector has applied," she says. "The scope and the size of the business plans I've done made putting together this business plan easy. Working with all the personalities I have at the executive level and coaching them helps me in negotiating with banks, contractors and real estate agents. And my experience in managing people and large teams has really helped. We get feedback on our staff, and people say they haven't seen customer service like this in years. "Other franchisees ask me how I got my talent. In reality, we're just paying minimum wage, but we're able to motivate, retain and train talent even when we're not paying top dollar. " Those are the skills that are impressing franchisors, says Nikki Sells, vice president of franchise development for Tasti D-Lite, which has welcomed at least five new franchisees from the financial sector in the past five years. "Those folks are smart, they understand numbers, and most of them have been in management and know how to build teams and how to hire and motivate," she says. "It's a natural fit." David Ambinder spent 23 years as a manager of business support services, his last stint as senior vice president, director of global business support services for Lehman Brothers. When he left the company, he could have easily parlayed his experience into a cushy consulting job, but he wanted to make a break with the world of high finance. "Being a handyman is almost the opposite of a person working on Wall Street," Ambinder says with a laugh. He opened his Mr. Handyman franchise in Union County, N.J., in November 2008. He doesn't fix leaky faucets himself, but he manages full-time a crew of five skilled workers, all with 25 years to 40 years of experience. He struggled to get the company off the ground, but he says he is on track to grow the business 50 percent this year and expects a similar gain next year. He received Mr. Handyman's rookie of the year award in 2009. "What it comes down to," he says, "is on Wall Street, you have extremely high standards at the service level, and you bring that to your new business." But transitioning from a high-pressure, high-powered culture to the more relationship-focused franchise world can be problematic, too, Cohen says. And some former executives question or refuse to follow a franchisor's system, thinking they know better. "Wall Street people often view themselves as being right," the career coach says. "And there might be some dissonance from how they view the business versus what the franchisor wants." There are no hard numbers on exactly how many financial sector employees have moved into franchises, though franchisors and franchise brokers note that a large part of the massive uptick in franchising last year--which, according to the Kauffman Foundation, saw the highest level of entrepreneurial activity in the last 14 years--are former executives and professionals trying to take control of their futures, including a healthy dose of bankers and financial-service types. And they rarely return to the corporate world. After Black Monday sideswiped Wall Street, Craig P. Shiple left the industry in 1988. "I think the parallels between 1988 and 2008 literally overlay one another," he says. At the time, he was five years into a career with Dean Witter. When the stock market fell by 35 percent in a couple of days, he was spooked. "My ability to earn a living cataclysmically fell off the face of the Earth overnight. I thought ‘I can't be part of that.'" So Shiple joined HouseMaster, a new home-inspection company, setting up his franchise on the east coast of Florida. He's had ups and downs but doesn't regret his career change one bit. "There's never been a glimmer of questioning if I made the right decision," he says. 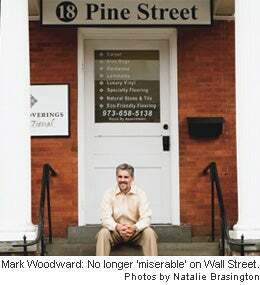 "But there's overwhelming evidence that I succeeded as a franchisee because of my experience on Wall Street. If you have a short sales pitch you recapitulate hundreds of times, you'll have a ringing phone. That theme is difficult to hone in someone who didn't experience the feast or famine of the financial sector." And there's the ultimate draw of the lifestyle. That's what Mark Woodward relishes most about starting a Floor Coverings International franchise in Rockaway, N.J., two years ago. He was the controller for Fred Alger & Co., a broker/dealer, investment advisor and mutual fund company, until a day when everything clicked--he'd paid off his mortgage, the Madoff scandal was breaking and the financial sector was tanking. Time to start fresh. With no small-business experience, franchising seemed logical: "What you're selling is irrelevant, whether it's cars, securities or floors. The reason people buy is because they trust you. "On Wall Street," he says, "I was making a prodigious amount of money and I was miserable. I didn't like who I'd become. In this biz, it's the total opposite: Everybody is helping one another. And that's what I love." "Dealing with customers is the same no matter what type of business you have. Some are easy to please, some are more demanding. You have to learn to deal with them all in the proper way." "Some of my biggest stumbling blocks have been staff. In finance, when you interview people to be an accountant, all that determination and drive and capacity for hard work are a given. When I started franchising, I assumed those were a given, too. But I've gone through three salespeople. The person I have now is a godsend--the key to getting us to where we want to be." "I communicate differently than other service companies. We actually do what we say. That's expected in the investment world but not expected in the service industry, especially not in a suburb of New Jersey. People are surprised when they get an e-mail or someone calls to makes sure they're happy. That is something that has transferred well." "I certainly didn't want to do a startup business, many of which I'd encountered in the financial world--you're always torn, making decisions on how to grow and losing flexibility and autonomy. Franchising seemed right for me. I spent a year deciding what franchise company I wanted to join. I learned about the board, I knew what the product could do, and I knew who was behind it."